Discussion in 'Online Games - News and Reviews' started by Marina, Feb 7, 2014. Winterberries online video slot has now been released from the Scandinavian games provider Yggdrasil Gaming. This high variance video slot game is sure to become a favorite amongst online players. With a name like Winterberries, the graphics sure live up to the expectations with mouth watering wins that are set to bring an ice cold chill to you with winning combinations. that bring a taste of freshness in the midst of freeze. It's the freeze you are after in this ice chilling berry adventure. 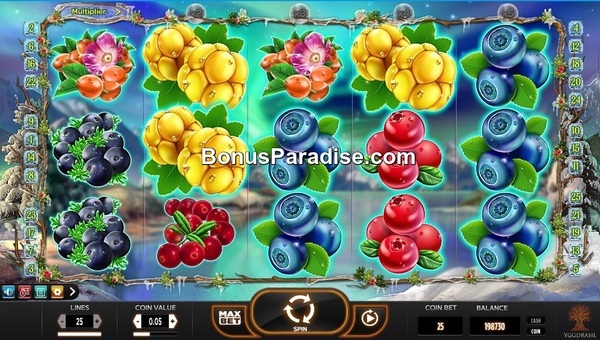 Winterberries is a 5 reel, 3 row, 25 fixed payline video slot. All wins pay left to right. Players have their choice of coin value from .01 to 2 per line. Number of lines are fixed at 25 paylines. there are interactive icons on the bottom left hand side of the game console. Winning symbols include the yellow berries, blue berries, red berries, orange berries, dark red berries,purple berries and red and purple berries. Yellow berries bring the highest payout. with frozen berries to bring some great winnings. What's so special about Winterberries is the re-spin feature. When you receive a winning combination, those symbols "freeze" in place and a re-spin is activated. As long as one of the original winning symbols appear anywhere on the reels, it to will "freeze" and the re-spin will continue. Players can amass an incredible amount of winnings during the re-spin feature. could be as much as 5x's. There is nothing cold about this video slot. Winterberries is a wonderful and exciting online slot from Yggdrasil gaming. What a fun slot to play. Anyone have some good fortune on this one? Not me. Somehow I am not lucky at online slots from Yggdrasil.